I normally make a full breakfast for my husband on the weekends: eggs, hash browns, bacon. The kids usually opt for cereal unless I break out the pancakes or something else sweeter, then they’re all in. 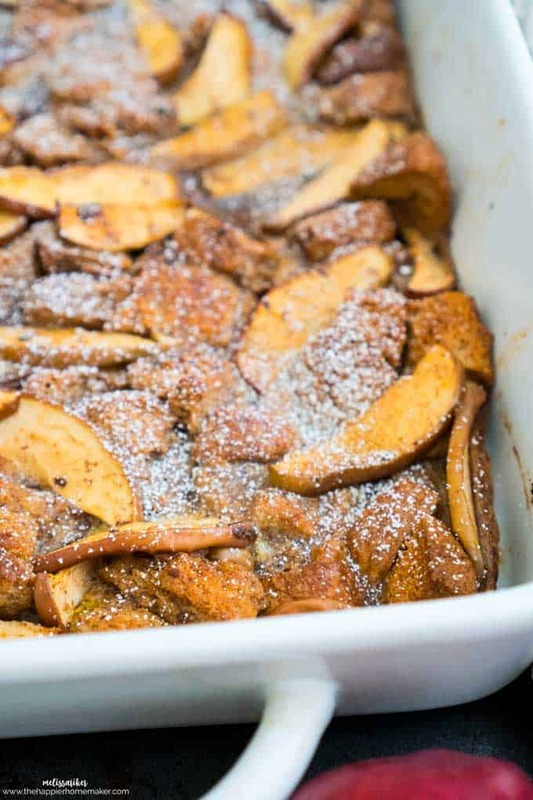 Recently I’ve been working on making more baked breakfast recipes because they are so easy to make and especially good for holidays like Thanksgiving and Christmas when you want to spend time with family instead of over the stove. 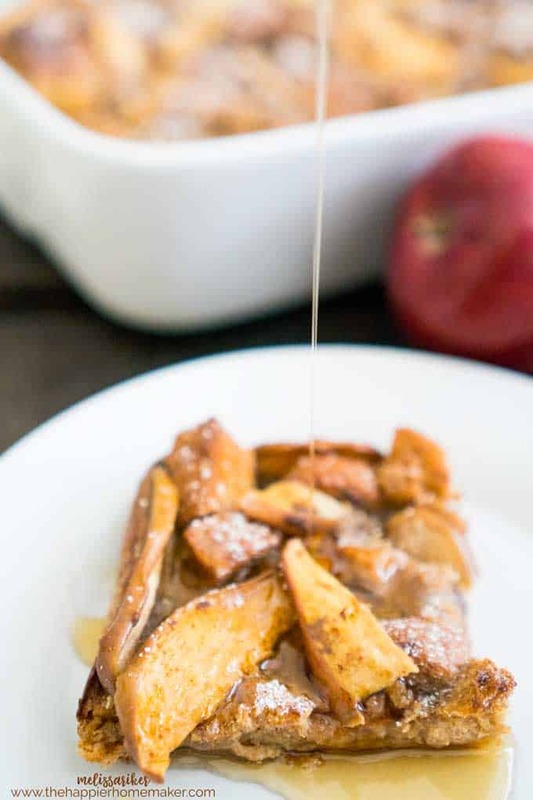 This Baked Apple French Toast is one of my favorite new baked breakfast recipes. I like to serve it dusted with some powdered sugar and topped with maple syrup….my mouth is watering just thinking about it! Give it a try and let me know what you think in the comments below! 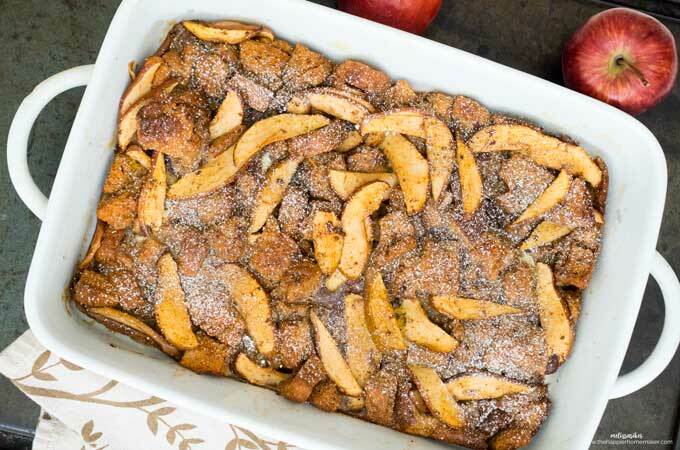 Apple Baked French Toast is an easy to make breakfast to feed the entire family. Perfect recipe for holiday brunch or Christmas morning. Preheat oven to 350 degrees. Spray a 9 by 13″ pan with nonstick spray. Place bread in a large mixing bowl. In a small saucepan combine apples, butter, milk and brown sugar and heat over medium high heat until butter is melted and sauce is combined. Pour apple mixture over bread cubes and stir to coat. Spread bread and apples into prepared pan , including all sauce in bowl. In a small bowl mix eggs, vanilla and cinnamon and pour over bread mixture. Bake for 45 minutes or until golden brown.